Lucky Punch is a love story set in tiny natural worlds sheltering from the encroaching urban dystopia of 1980s Auckland. In lyrical prose poetry, the author draws you into a beguiling world where wildness prowls the neighbourhood. Simone Kaho is a New Zealand poet with Tongan ancestry, part of a new generation of Pasifika voices. She lives in Auckland. ISBN 978-0-473-36751-0, 160mm x 225mm, pb, b&w, 88pp. This title is now also available as an ebook in both the Amazon Kindle and Kobo stores. “Lucky Punch mixes memoir with poetry, revealing an upbringing spent tree climbing and creek scouring and relived in deliberately low-key poems that have excellent form.” –Susanna Andrew, Metro Magazine. “Lucky Punch delivers a sequence of lucid prose poems or small fictions. At the heart—and this glorious arrival has heart—family, friendship, love. Scenes are so evocative you can smell and taste them. Anecdotes offer honeyed soft patches with sharp spikes.” –Paula Green, Your Weekend. 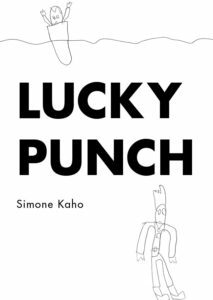 “Auckland author Simone Kaho’s Lucky Punch is another brave, beguiling first collection.” –Siobhan Harvey, NZ Herald.